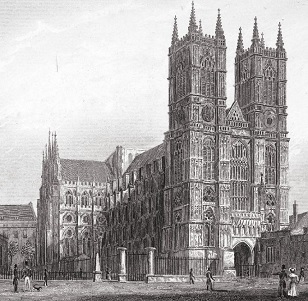 Westminster Abbey - Westminster Abbey was England's response to the great cathedrals of France in the Middle Ages. Though it was originally built in the 10th century, it underwent a major renovation (into its current form) in the 13th century during the reign of King Henry III. According to the 11th century monk, Sulcard, its history is even older. A church was founded on the site back in the 7th century when Mellitus became the first Saxon bishop of London (and the third Archbishop of Canterbury). Over the years it has undergone an interesting series of transformations. It was renovated as a Gothic Church, but originally built using Romanesque architecture (since it was first built before Gothic was introduced) and retains a few Romanesque characteristics. It was also originally a Catholic Church, but when Henry VIII broke with the Catholic Church it became the center of the Anglican Church. Henry assumed direct control in 1539 and granted the abbey the status of cathedral in 1540. Since the reign of Elizabeth I it has held the status of Royal Peculiar, which means it is subject to the jurisdiction of the monarchy and not the clergy. Both Harold Godwinson's and William the Conqueror's coronation were held there in 1066, starting the tradition of coronations for English and British monarchs being held at Westminster Abbey. It has also been the location of some 16 royal weddings since 1100.